More than ninety percent of the electricity we use to light our communities, and nearly all the energy we use to run our cars, heat our homes, and power our factories comes from large, centralized, highly polluting, nonrenewable sources of energy. It doesn’t have to be that way. In Power from the People, energy expert Greg Pahl explains how American communities can plan, finance, and produce their own local, renewable energy that is reliable, safe, and clean. Pahl uses examples from around the nation and the world to explore how homeowners, co-ops, nonprofits, governments, and businesses are already putting power in the hands of local communities through distributed energy programs and energy-efficiency measures. Renewable, community power is a necessary step on the path to energy security and community resilience, particularly as we face peak oil, cope with climate change, and address the need to transition to a more sustainable future. This book—the second in the Chelsea Green Publishing Company and Post Carbon Institute’s Community Resilience Series (http://www.resilience.org/guides)—also profiles numerous communitywide initiatives that can be replicated and scaled broadly. 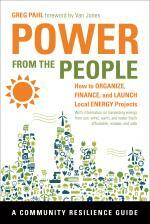 "Greg Pahl's Power from the People is an inspirational guide to the burgeoning community-power movement. His case studies of people who are making a difference are often tales of endurance and survival, but also powerful testaments to the human spirit. Bravo to Pahl and Power from the People for explaining how feed-in tariffs have produced a community-power revolution in Europe and how they can do the same here in North America."